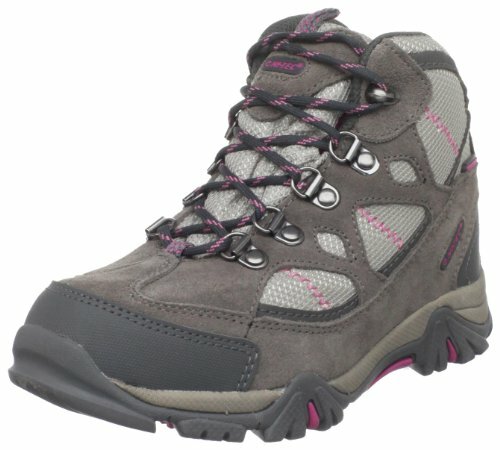 Hi-Tec Kid's Redondo Trail Boots,Gray,7 M Big Kid by Hi-Tec at Helix Alumni. SKU: 369869-7132771. MPN: 30089. Hurry! Limited time offer. Offer valid only while supplies last. Waterproof (seam sealed) suede leather and nylon upper. Features under construction. Abrasion-resistant toe protection. EVA sockliner for cushioning. Waterproof (seam sealed) suede leather and nylon upper. Features under construction. Abrasion-resistant toe protection. EVA sockliner for cushioning. Moisture wicking lining. Soft padded collar. Rustproof brass hardware. Board lasted with steel shank for added rigidity. Compression-molded EVA midsole. Durable MDT carbon rubber hiking outsole. Full length EVA sockliner. If you have any questions about this product by Hi-Tec, contact us by completing and submitting the form below. If you are looking for a specif part number, please include it with your message.